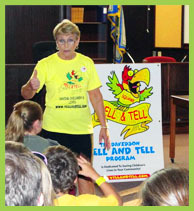 The Yell and Tell program teaches young children how to take action and be a hero when they observe a dangerous situation such as: POOLS ….RIVERS/LAKES…. FIRE …. POISON …. GUNS …. CHILD ENTICEMENT… and BULLYING. To contact the foundation, please fill out the form and we will respond promptly.